Soda machines and deep fat fryers are now allowed back in Texas public schools, thanks to Agriculture Commissioner Sid Miller's reversal of a 10-year ban. But many school districts say they have no appetite for reinstating the unhealthy choices for students. 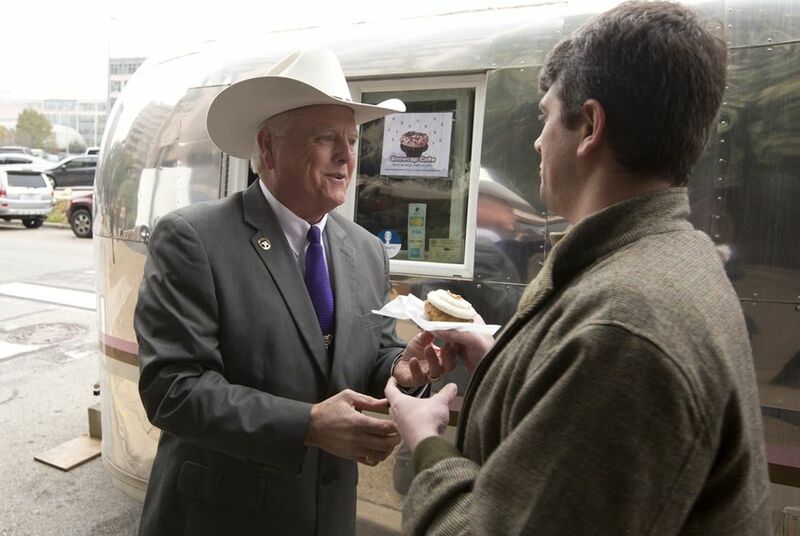 Students eager to purchase soda and fried foods when they return to school in the fall may be disappointed, despite Texas Agriculture Commissioner Sid Miller's recent announcement that both will be welcome back on Texas public school campuses after a 10-year ban. To the dismay of nutritionists and public health experts, Miller reversed the department's ban on soda machines and deep fat fryers in mid-June as part of a new state nutrition policy calling for more local foods, community engagement and training to help schools serve meals that are "attractive and taste great." But many large school districts aren't warming to Miller's initiative. "Despite the reversal, we believe the healthy changes that have been made to our school menus remain in the best interest of our students," said Melissa Martinez, a spokeswoman for the El Paso school district. "It also would be cost prohibitive to retrofit all of our kitchens with deep fryers." Eight of the state's ten biggest school districts — Houston, Dallas, Cypress-Fairbanks, Forth Worth, Fort Bend, Northside, Austin and North East — also said they have no plans to serve fried foods or soda. Calls to districts in Katy and Aldine were not returned. "We removed our deep fat fryers more than a decade ago, and we have no desire to bring them back," said André Riley, a Dallas district spokesman. Despite the change, schools still need to comply with recent federal guidelines limiting the number of calories students consume. As part of the stricter standards, the Smart Snacks in School regulations apply to foods sold a la carte, in the school store and in vending machines. The agriculture department intended for the reversal to be a symbolic move giving more control to schools, not a directive for districts to reinstall fryers or soda machines, said spokeswoman Linda Ryan. "It's about believing that teachers, school boards, school districts understand more about the kids and their needs in that area than we do," Ryan said. "It is up to them to make those choices." As part of the policy, school groups will be allowed to sell fatty foods or sugary sodas at campus fundraisers six times per year, up from once, and to sell during school hours. When he solicited public input before deciding to roll back the ban, Miller received almost 200 comments. A number said school organizations like booster clubs and parent teacher associations have struggled to raise money limited to just one fundraiser per year. "It would be in the best interest of our district if fundraisers be exempted from Smart Snacks and instead be controlled and monitored at the local level by campus administration," wrote an employee with Klein Independent School District Nutrition and Food Services. A parent in Orange County, near Beaumont, also wrote the commissioner, saying that a change to the fundraising rules would help pay for a new playground at his child's elementary school. The policy takes effect July 1.